British police have compiled a dossier of “intelligence” on a group of teenage girls from London thought to be at risk of traveling to Syria to join the Islamic State (IS, formerly ISIS/ISIL), a judge has heard. Justice Hayden was told by lawyers that UK police had set up a 39-page “running log” after social workers warned that a handful of girls wanted to travel to IS-held territory, according to the Press Association. The judge declared a number of the at-risk teenagers wards of court, which bans them from traveling abroad without a judge's permission. The revelation about the police dossier came at a hearing in the Family Division of the High Court in London, where cases relating to a number of teenagers thought to be at risk of traveling to IS-controlled areas were being analyzed. The judge was told the dossier included several pages of intelligence on individual girls. The hearing focused on a girl who went missing but was picked up by police before her plane to Istanbul could depart last year. The girl “expressed great remorse” and was embarrassed, Hayden heard. In March, five teenage girls who attend the same east London school as three girls who fled to join the IS in Syria in February were put under the travel ban. The children, all at Bethnal Green Academy and aged 15 and 16, have been made wards of the court to prevent them departing for Syria. In mid-February Kadiza Sultana, 16, Shamima Begum, 15, and Amira Abase, 15, fled from their homes in east London and managed to board a flight to Istanbul, from where they are thought to have traveled to Syria overland. 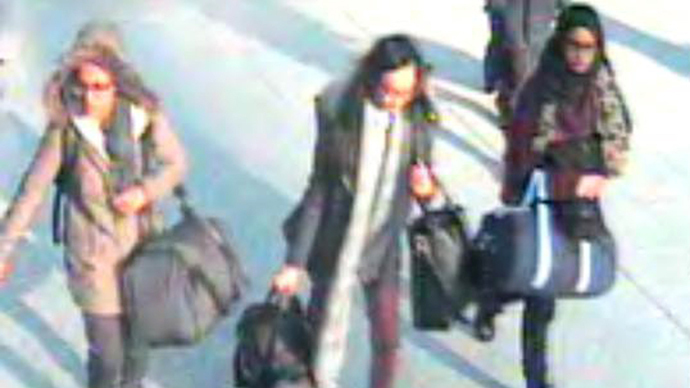 After the girls’ disappearance in February, Prime Minister David Cameron announced that all teenagers boarding flights to Turkey could be challenged by airlines about why they are traveling alone and if they plan to join the IS.